We are down in Baños de Agua Santa, now, relaxing after an exciting summit attempt. We made our approach to Chimborazo on early Tuesday morning after a night of heavy rainfall at the Posada Urbina at 11,800 feet. 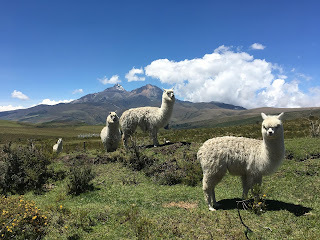 We could see fresh snow on the flanks of Chimborazo in the morning and knew the whole mountain had received a new deposit. As we made our way to the south side of the mountain we could see just how far that snow had reached, coming right down to the park entrance. Stopped on our approach to the park entrance to take pictures of Vicuñas and the mountain. Our bus driver, Victor, did his best to make our way up the snow covered road to the hut, and we passed many other vehicles attempting the same thing without as much success – stuck on the side of the road. After getting stuck ourselves for a minute and a some repeated (and finally successful) attempts moving around very slippery corners, we made it to the lower refuge. We had lunch and discussed our options. With the weather as bad as it was, it seemed unwise to head to a high camp; instead, we decided to stay at the refuge and make our summit attempt from there. At dinner time it was still snowing and windy. We hoped things would change for our 9pm wake-up time, but at 9 it was still snowing, and we decided to delay another hour and hope for improvement. At 10pm the snow had stopped, and we could see towards the upper mountain and make out the ridges up high. We all got up, dressed, and made ready for our summit attempt, and by 11pm we were heading out in the snow. It wasn't perfect by any means, but we were ready and thought we would climb the lower slopes, give it our best effort, and see what developed. By the time we had climbed several hundred meters, things changed, and the sky lit up with lightning, with thunder following shortly thereafter. We immediately turned around and headed back to the safety of the refuge. We called it good for the evening and decided to wake up and see what the morning held. It snowed all through the night, and there was 10cm of fresh snow at the refuge on Wednesday morning, which meant there was a lot more higher on the mountain. We used our satellite phone to call for a weather forecast to see if there was any hope things would abate in the near future. Unfortunately, the forecast only showed further stormy weather for the remainder of the week. It seems that every part of the world is experiencing inconsistencies with the local weather norms! With this news and probable unattractive avalanche conditions higher on the upper mountain, we decided to call our attempts there and head towards Baños. But we still had a few complications to face. Because of the snow, our bus would not be able to make it to the refuge, so we loaded up the jeep that we still had at the hut with all our bags and hiked the 8km down the snow covered road to meet our bus. We were soon safely off the mountain. Our 2.5-hour ride to Baños yielded no sun and lots of rain. It was obvious this weather was not isolated to Chimborazo, but rather a regional issue that was not going to leave anytime soon. Until next time, the mountain will wait. I was really happy with our group's preparedness and readiness to tackle this objective, and I'm sure under better conditions we would have had an extremely good chance of success. It is a very strong team, and I congratulate them on successful summits of Cayambe and El Corazón as well as for all the new skills acquired during the trip. It's been a great experience and I'm going to miss our team members. Vicuñas spotted on our morning approach to Chimborazo. Our group is learning some valuable lessons about the mountains! We are at the lower Chimborazo Refuge. There was a snowstorm last night and at the moment it's snowing sideways! On our drive to the refuge today, there was snow on the road, as well. Our driver did an excellent job in getting us here safely, but it took a little longer than expected. With the current conditions and our delayed start, we have decided not to continue on to the high camp tonight, as planned. We will stay at the lower Chimborazo Refuge this evening, and if the weather is good enough, we will leave at 10:00 pm to begin our long ascent. If we are not successful, we will stay at the refuge tomorrow night and try again in the wee hours of Thursday morning. Our group is doing very well, especially considering this change in plans. We've had such beautiful weather on Cayambe and Corazón, it's a little disappointing to be facing more challenging weather conditions now. However, this provides a great opportunity to discuss the ways we are humbled by the mountains and it puts the relative scales of humans and mountains into perspective. We may have joined this trip to learn about climbing, but we are learning so much more than how to climb! We'll call again tomorrow to let you know how it goes. This afternoon we arrived at Posada del Tren in Urbina. We’ve had a few clouds, but it’s very pretty and mild. Folks are out on the porch taking in the views, and some are playing chess. It’s a low-key afternoon. The wood truck just showed up to deliver firewood. A couple of young puppies are here, playing on the grass. They’re showing us their boundless energy and we’re demonstrating our skills in relaxation. That’s been the defining quality of the day. We are being sure to develop clear contrasts with our hard workdays – our days of ascent. I don’t think I mentioned it, but today we didn’t meet until 11 am to give team members a relaxing morning. That allowed each person to go about their morning rituals with no rush. “Slow coffee” was the word. 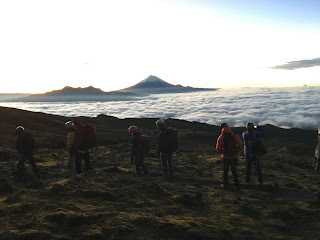 Yesterday’s climb of Corazon was moderate in length and strenuousness, but it started with a very early morning and gave us a great workout at altitude. People were understandably tired and enjoyed having a restful night and easy morning. We left Quito in the late morning and drove a couple of hours to the provincial capital of Ambato where we had lunch. We chose a Mexican restaurant, which we found to be of super high quality. After lunch, we drove 45 minutes up onto the flanks of Chimborazo to Urbina. A lot of us got in 45-minute siestas – it will happen, with full bellies and a gently moving vehicle. We’re going to have dinner at 7:30. The dish of the night is quinoa stew and judging by the aromas already coming from the kitchen, it’s going to be good! Tomorrow morning, we will move on to Chimborazo and prepare for our ascent on Wednesday or Thursday. The traditional approach doesn’t have enough snow on it for our preference right now, so we’re using an alternative route that avoids the lower slopes that can be subject to rock fall when they aren’t covered well by snow. We won’t stay at the hut on Chimborazo but will set up a high camp instead. After meeting the other guides who will be joining us for the ascent at around 11 am at the entrance to the park, we’ll drive to the hut for lunch, then hike about two-and-a-half hours to the high camp. We’ll have porters help us by carrying all the tents, stoves, fuel, and food, while we carry our sleeping bags, pads, and all of our personal gear. Whoa! Now we’re getting a shower of hail! It’s pea-sized. We have an imposing, single cloud passing by, trying to impress us. OK, that’s the evening news. We’ll give you an update tomorrow after we get to our camp. We had a stunning day on our ascent of El Corazon yesterday. We woke at 1:30am to have some light food and prepare to depart. We left camp at 2:30am for a 15-minute drive to our trailhead. The weather looked really good, and we were excited to be on our way. The route started as a dirt road for the first hour before we turned off onto a narrow path through the paramo. From there it was a somewhat rolly terrain and gradual ascent through the beautiful open grasslands. We arrived at the mountain’s technical rock ridge just before sunrise and donned our helmets and harnesses there as we waited for the sunrise. The weather was just brilliant, with a low lying cloud layer and stunning views of Cotopaxi, Rumanahui, Tungaragua, Chimborazo, and the Illinizas. We continued along the rock scramble ridge, taking our time to make sure climbers moved securely. We spotted and coached climbers on a couple short sections, but otherwise the ascent went without complication. We arrived at the summit just after 7:30am with amazing views of all the major peaks of Ecuador. In addition to the peaks we saw earlier, we now also could see Cayambe, Antisana, and El Altar. These were by far the best views I've ever had in Ecuador. From each of the big peaks you can see most of the country’s major summits, but I’d never seen them all from a single vantage point as we did on Corazon. We enjoyed the summit for about a half an hour and started our descent. We took the down-climbing very slowly to make sure everyone moved securely and used the rope to belay a short down-climbing section. After an hour we were back onto non-technical (unexposed) terrain and could move more quickly and comfortably. We arrived back at the trailhead just after 11:00am and headed to our camp. We had some delicious scrambled eggs and very nice Ecuadorian coffee before loading up the bus for our ride back to Quito. We arrived in the city around 1:30pm, and everyone was excited to relax or catch up on sleep after an early morning and a good workout. We are planning to meet at 11:00am today for our drive south towards Chimborazo. It’s going to be an easy travel and recovery day, which is well earned after another successful summit by the whole team. We'll give you another update later this afternoon to let you know how our day has been. Group on the summit of El Corazón. Illinizas in the background. Chimborazo and El Altar far away on the left. Llamas on the return hike down from El Corazón. We had a very interesting day, including some wild weather that forced us to make alternate plans. This morning was very nice at the Hacienda Guáytara with sun overhead, but threatening clouds to the East, the direction of Antisana. We left the Hacienda at 11:00am and headed into the Antisana Ecological Reserve. While we were completing our entrance paperwork we could see Antisana being hit with rain, snow, and lightning. The thunder was audible from our location. We got into our rain gear in preparation for what we were heading into and started our drive toward camp. About 3km from camp we encountered snow and graupel on the dirt and grass road. Calling it a road is giving it a little too much credit as it is only utilized occasionally by climbers, and it is more grass than anything. This made for very slick conditions, and the bus and SUV couldn't make any progress, despite our persistent attempts to make passage. The other guides and I held a meeting to discuss our options. Camping at our location and making a summit attempt from there really didn't seem like a reasonable choice, as adding 3km to the approach would add too much to an already very big day. We thought of alternate objectives and considered Illiniza Norte and El Corazón, both non-glaciated climbs with some technical rock scrambling. We presented our options to the group to see what most interested everyone. A unanimous decision was made to try to do El Corazón because we could easily do it in the same time frame as Antisana, whereas Illiniza Norte would require taking a day out of our Chimborazo schedule and potentially decreasing our chances of success on that major objective. So with a new plan chosen, we made arrangements to stay at Chuquiragua Lodge below El Corazón and go for it in the very early morning tomorrow. We then headed back towards the Pan American Highway and to the southwest to Chuquiragua Lodge. We enjoyed a Chinese food style dinner of sweet-and-sour chicken and fried rice. Our plan is to leave at 2:30am for our climb of El Corazón, which should give us the best chance of good weather early in the day. With the conditions across the region today of rain and thunderstorms, we think this is our best possible schedule. This should put us on the summit sometime just after dawn and back down and on our way to Quito around noon. We'll let you all know how it goes! We had an excellent travel day and are now resting/recreating at a nice hacienda. There are billiard and foosball tables here, and our team members are busy playing games! This morning we left the Cayambe region and drove south towards the Antisana Reserve. The first highlight of our trip was stopping at a local coffee and chocolate factory! Jaime, one of our Ecuadorian guides, is friends with the owner of Velez Coffee, located very close to the Equator. We were lucky enough to tour the whole factory! We saw the giant coffee roasting floor, watched the chocolate being made, and fortunately also had the opportunity to purchase the delicious Ecuadorian coffee and chocolate to bring home. After Velez Coffee, we visited the Equator and continued on to the Antisana region. We stopped at a great place for lunch where a lot of us ordered meat sandwiches "a la piedra" (on the rock), literally sandwiches that had been cooked on hot rocks. They were very reminiscent of fajitas and tasted delicious! We made a couple stops en route, one at an ATM and another at a pharmacy so folks could pick up a few small items like ibuprofen and sunscreen. Now we are relaxing at the hacienda before dinner, and we're all really looking forward to the fresh, locally grown food, here! The cooks just walked by on their way to the lake to catch the trout for our meal, and the steak is from cows raised on the farm outside the hacienda. Pretty spectacular! Everyone on the trip is doing really well. We're all still thrilled about summitingCayambe yesterday! Three people were not feeling 100% before the climb, but they all still felt good enough to make the ascent and are now doing much better. It's fun to have such a big group on this trip, and I'm excited that each of them is staying for the five-day extension to climb Chimborazo too! Everyone works really well together. Great team! They're still busy playing foosball and pool, so we'll ask someone to say "hello" in the next report. We had nice weather today. We've been enjoying a nice mix of sun with light clouds that pass by or dissipate after only a couple minutes. We leave tomorrow for the Antisana base camp and will call again, soon. We woke at 11:00pm and everyone started about their chores of getting dressed, finishing packing, and eating some light breakfast food. We departed just after midnight from the Refugio in very light fog, and made our way up the familiar approach trail to the glacier. It began to snow lightly as we put on our crampons and roped up, but the snow dissipated quickly as we gained elevation on the Glacier Hermoso ("beautiful glacier"). Temperatures were cool but manageable with light layering and soft shells. As the twilight gave way to dawn we could tell our good weather was going to hold for the remainder of our ascent. Our teams maintained similar pacing throughout the climb and we all tackled the final steep pitch, one jutting serac (ridge of ice) after another. All teams summited between 6:30 and 7:15am during our first direct sunlight of the day. We had great views of the massive mountains, Cotopaxi and Antisana, as well as peaks of bits of rural countryside through the clouds below us. 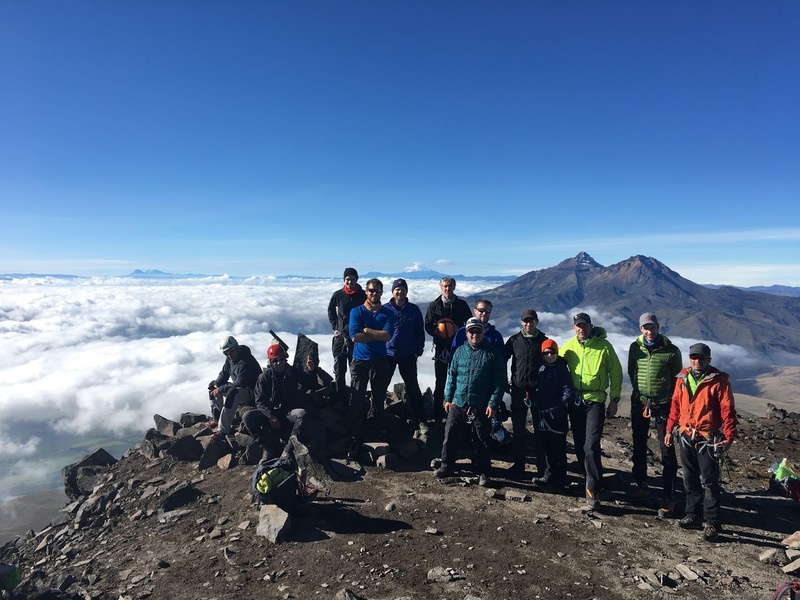 It was a truly exceptional climb and summit experience for everyone! As is normal, our descent took a fraction of the time as our ascent, with all teams arriving back at the Refugio by 10:30am. We had some soup and packed our things for the ride down the mountain road. We said goodbye to the hut caretakers and took off at 11:30am for Hacienda Guachala. We arrived and settled into our rooms, then ate lunch outside near the courtyard because the weather was so nice. Lots of sunshine made for great afternoon napping conditions! Everyone was very pleased to have rested and then prepare for our next objective, Antisana. But for now, we are enjoying our recent success. We're looking forward to visiting the Equator tomorrow, and traveling to the Antisana province. We'll update everyone, again, soon! Descending next to the toe of the Glacier Hermoso after our skills day. Eric and Loic Vincent on the summit. Eric and Loic Vincent with guide Jaime Avila on the summit. Left to right. David, Tom, Jeremy, Glenn, Jimmy, Mike, and Estalin. Summit photo. (Mike) Things are going really well. This morning we woke up and ate breakfast at 7:30, then got going at 8:30 with our glacier skills day. The training including instruction for new climbers and review for more experienced climbers on crampons, self arrest, front pointing and other technical climbing skills. We headed back down to the hut at 1pm and we're now trying to get some rest before tomorrow's early start for our Cayambe summit attempt (18,996 ft / 5790 m). We're planning for a midnight start at the latest. Some folks had a rough evening of sleep last night because they were so giddy and excited to be up at altitude. A few people were feeling a bit under the weather yesterday, but it looks like everyone will be attempting the summit tomorrow. It will be good to have the whole team together! (Jeremy) The weather looks promising for tomorrow. It's not stormy, but we have some low clouds. Fortunately it's not windy or wet, which is a great sign! We'll update you after tomorrow's climb. Ciao! Hi, it's Jeremy calling from Ecuador! Everything is going really well. We are now at the Cayambe Refuge (15,250 ft / 4648 m). This afternoon we enjoyed a good hike above the refuge, and tomorrow is our glacier skills training day in preparation for Cayambe. The trip is going well! Everyone seems to be adjusting very well, now having completed our two acclimatization hikes. We are gradually climbing higher and reaching our objectives, no problem. Today we hiked in our glacier boots for the first time. We were scrambling over rocks and everyone seemed to negotiate the terrain without any trouble. It was really nice to see Glaciar Hermoso (“beautiful glacier”). It has such cool towers of ice! The food has been excellent! Both at the hotel and at the hacienda. We have a really excellent group of people, with folks from Switzerland, England, Australia, Canada, and the U.S., plus our Ecuadorian and American guides. Our weather has been cloudy and misty, with only a small drizzle yesterday, but no wind. It really makes for nice hiking, and is actually much better than bright sunshine. With that said, we are hoping for at least a few sunny views while we're here! Our supper is planned for 6:30, tonight, then we're hoping to get a good night's sleep for the skills day. Although our weather has not been sunny, it also hasn't been stormy; it appears to be calm at the summit with no winds at all. I am hopeful about our coming summit attempts on Cayambe and Antisana! We'll call tomorrow with another update. Ciao! Today was our last morning in Quito for a while. After a nice breakfast, we met promptly at 8:00am with our bags packed and loaded our little bus for a short ride across town to the Teleférico, a gondola lift running from the edge of the city to the Cruz Loma viewpoint. We paused to grab snacks and make tuna sandwiches for lunch, then climbed aboard. After our aerial lift, we set off at a casual pace on our second acclimatization hike, Gua Gua Pichincha (15,696 ft / 4784 m). Everyone did an excellent job of negotiating the minor rock scrambles we encountered on our ascent. The trail was a bit wet from overnight showers, and we had pretty dense cloud cover above, which allowed for nice, cool climbing temperatures for hiking! We stopped halfway up to put on our shells when it looked like we might see a little rain, but for the most part we stayed very dry. We made great time on Pichincha, arriving at the summit two-and-a-half hours after we began our hike. We ate a bit of lunch, but didn't stick around too long since the showers were heavier on top of the mountain. We descended carefully down the rocks, making good time on our way down. As we descended, we were rewarded with clearing skies and views of Quito. Our round trip time was only five-and-a-half hours. Not only was this a great pace, but we also got down in time to avoid most of the afternoon rush hour traffic as we left the city to make our way to Hacienda Guachala, located in a lush area down valley from Cayambe, the first major peak we will be climbing. We arrived at the Hacienda at 5:30 and had a wonderful dinner at 7:00. Much of the team ordered the house specialty: trout with shrimp sauce. The meal was a perfect end to cap off a great day! Everyone seems to be having a really good time. Loic likes the Hacienda's history and rustic charm. Glenn and David enjoyed a father-and-son card game after dinner tonight. And somehow we all managed to have a civil conversation about national and international politics over the meal! It helps when we have six different nationalities; represented our own mini UN! We're looking forward to our approach to Cayambe, tomorrow, and seeing our first glimpse of the mountain. ¡Hablamos luego! We had a great hike of Cerro Pasochoa, today (13,776 ft / 4199 m); the cool temps and breeze provided perfect hiking temperatures. We summited in about two hours without really pushing ourselves. Excellent work by the whole team, which I should add, is acclimatizing very well. We had some clouds on the way up, but it cleared off pretty well at the top, and we got some great views. After enjoying our time on the summit, our descent went pretty fast and we were back at our vehicle before afternoon sprinkles began. Perfect timing! And for tomorrow we are looking forward to our next acclimatization hike up Gua Gua Pichincha (15,696 ft / 4784 m). Everyone has arrived safely for their climbing adventures in Ecuador! This morning we met for a trip presentation and slideshow highlighting our climbing objectives ahead. We also did an equipment check to make sure everyone had what they needed for our climbs. The group was really well-prepared with only a few missing items that we were able to obtain in local gear shops here in Quito (9500 ft / 2895 m). We also made a quick stop on the way out of town to try on rental boots for those in need. With our equipment business wrapped up, we headed to Otovalo for their Saturday outdoor market. On our drive we crossed the equator! There was no sign present to indicate we were at the crossing, most likely due to local authorities wanting to prevent increased traffic and potential accidents caused by people stopping on the shoulder of the Pan-American highway. We arrived in Otovalo in the early afternoon and went to lunch at Mi Otovallito, a lively lunch spot with flute players and excellent service. After lunch we split off to explore the market. There were many craft merchants selling alpaca blankets, ponchos, art, jewelry, and if you went down the right aisle you'd find more typical goods geared toward locals, including shoes, pants, sweatshirts, and belts. We enjoyed our time in the market and started our drive back to Quito in the late afternoon. Clouds had been building all day and it was obvious rain was falling on the hills in the afternoon. The drive back was highlighted by a stop for bizcochos and coffee. Susan and Dean likened the bizcochos to pie crusts - Yum! They're sweet and go very well dipped in coffee, like biscotti. We also saw a long parade of cars displaying flags for a local presidential candidate that obviously has broad support in the Cayambe district. Elections are being held next Sunday, Feb. 19th. It's exciting to be in Ecuador during an election and to witness their democracy in its active process! Interestingly, as well, it is mandatory for people 18-65 years of age to vote here, and optional for 16-17 year-olds and those over 65. I'll write more, tomorrow, after our first acclimatization hike, Cerro Pasochoa. Chao! Some of our team enjoying bizcochos and coffee. We left at 11:25pm, last night, for our summit attempt of Chimborazo. We made it through the initial climb above the Castillo (castle) at 1:00am. Continuing above there we encountered some wind, but it was not as bad as we had been experiencing earlier in the trip. At 4:00am Rod and I reached 18,700 feet and decided to turn around. Shortly after that the other two climbing teams, which were higher on the mountain, checked-in and let us know that they were finding poor snow conditions. The mountain had received a lot of snow in the past couple weeks, and it had metamorphosed into a crust layer a couple inches thick. Under the crust they found a foot or more of light fluffy snow, and below that there was a layer of large graupel [soft hail or snow pellets]. The breakable crust made movement difficult and the combination of layers meant the avalanche was not as low as we wanted it, so the entire team decided to descend. We were all back at the hut by 6:30am and were very tired from our efforts. It was a unanimous and quick decision by the group to head to Baños today and not make another summit attempt on Thursday. It was clear to us that avalanche conditions were not going to change overnight. It’s extremely unusual to have this kind of snowpack at this time of year (which is the middle of the prime climbing season), but you always have to accept and deal with what the mountains present to you whenever you go. You can never let yourself be deceived or let your desires for completing a climb trick you into making decisions on the basis of what conditions at a particular time “ought to be.” In this case, the mountain wasn’t ready for us, and we accept that. Thanks to everyone on the early section of this expedition for helping our Chimborazo team prep and acclimatize for this final objective. Our highest elevation reached today was Franklin and Ben's team at 19,450 feet. We are now relaxing in the semi-tropical down of Baños. We’ve dropped down to about 6000 feet here, and though that’s a lot higher than the Amazon Basin, we’re at its geographical edge, and the climate is dramatically different from Ecuador’s central valley system. I should note that everyone appreciates that there are palm trees here – a fun contrast to the alpine and sub-alpine environments in which we’ve been climbing. We’ll enjoy another day here and return to Quito on Friday. It’s been a great trip and we’ve really enjoyed each other’s company, the climbing, the many beauties of Ecuador, and – don’t let me forget – the great food!